If you own two GoPRo Hero cameras you might be please to know that GoPro have now started shipping their new 3D Hero Expansion kit which was showcased at CES earlier this year. The new 3D kit allows you to combine two GoPro cameras together to create a single 1080p 3D camera. A link cable is supplied to sync the two cameras together and is plugged into the back of each camera, allowing them to function as one camera. A single shutter button then controls both cameras. 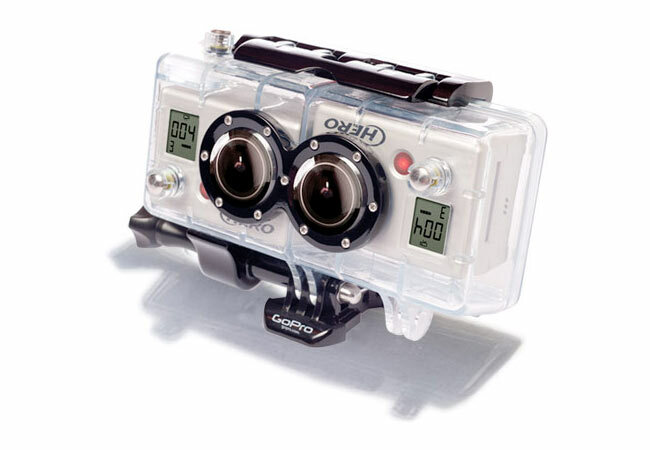 The 3D GoPro Hero camera casing is also waterproof to 180 feet, and can be worn on the body, mounted on gear and vehicles, or used as a handheld camera, making sure you never miss that all important footage whatever your favourite sport is. The 3D Hero System housing is only 5 inches (130mm) in length and 2.5 inches high (62mm) and is compatible with existing GoPro mounting accessories.